For the biobrick Part:BBa_K863005, there was a 27.1 % of identity match and 54.3% similarity match to the top allergen in the allergen database. This means that the biobrick part is NOT of potential allergen status. 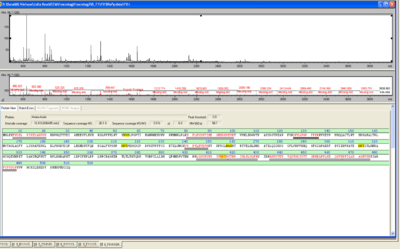 In 80 amino acid alignments by FASTA window, no matches found that are greater than 35% for this biobrick. This also means that there is NOT of potential allergen status. 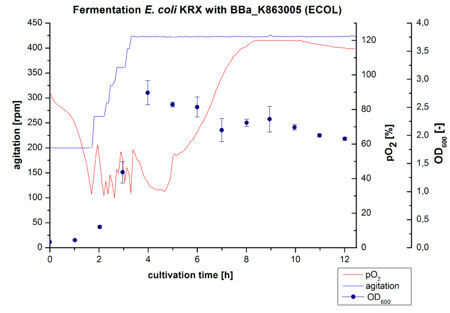 Another scale-up of the fermentation of E. coli KRX with BBa_K863005 was made up to a final working volume of 6 L in a Bioengineering NFL 22 fermenter. Agitation speed, pO2 and OD600 were determined and illustrated in Figure 4. There was no noticeable lag phase and the cells immediately began to grow. The cells were in an exponential phase between 2 and 4 hours of cultivation, which results in a decrease of pO2 value and therefore in an increase of agitation speed. After 4 hours of cultivation the maximal OD600 of 2.76 was reached, which is comparable to the 3 L fermentation of E. coli KRX with BBa_K863005. Due to induction of protein expression there is a break in cell growth. The death phase started, which is indicated by an increasing pO2 and a decreasing OD600. 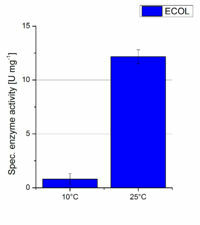 This demonstrates the cytotoxicity of the laccase for E. coli, which was reported by the DBU. 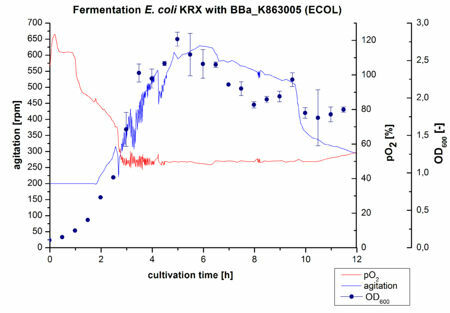 In comparison to the fermentation of E. coli KRX with BBa_K863000 under the same conditions (OD600,max= 3.53), the OD600,max was lower. Cells were harvested after 12 hours. 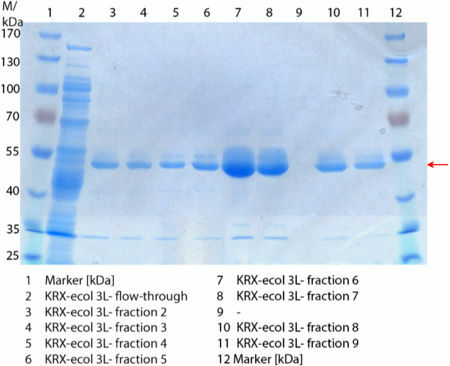 In Figure 6 the SDS-PAGE of the Ni-NTA His tag purification of the lysed culture E. coli KRX containing BBa_K863005 (6 L fermentation) including the flow-through, wash and the fractions 1 to 15 (except from fraction 11/12) is shown. The red arrow indicates the band of ECOL with a molecular weight of 53.4 kDa, which appears in all fractions. The strongest bands appear from fractions 3 and 8 with a decreasing amount of other non-specific bands. In summary, the scale up was successful, improving protein production and purification once again. 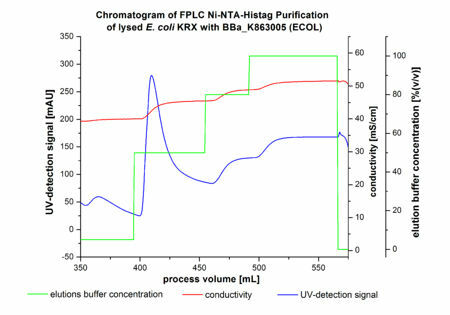 Figure 7: Fermentation of E. coli KRX with BBa_K863005 (ECOL) in an Bioengineering NLF 22, scale: 12 L, HSG autoinduction medium + 60 µg/mL chloramphenicol, 37 °C, pH 7, agitation on cascade to hold pO2 at 50 %, OD600 measured every hour. 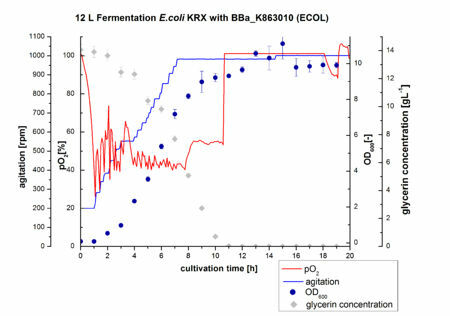 <p align="justify"> Finally another scale-up was made and E. coli KRX with BBa_K863005 was fermented in an Bioengineering NLF 22 fermenter with a total volume of 12 L to produce a high amount of the enzyme for further characterizations. This time HSG autoinduction medium was used to get a higher biomass. Agitation speed, pO2 and OD600 were determined and the glycerin concentration of the samples analyzed. The data are illustrated in Figure 7. For adaption to the medium, there was a lag phase of one hour. Between the 3 and 8 hours of cultivation the cells were in the exponential phase. During this phase the cells consumed O2, so that the agitation speed was increased automatically, as well as glycerin. After 11 hours of cultivation the pO2 increased, the glycerin was completely consumed and the cells were in the stationary phase. The maximal OD600 of 11.1 was reached after 15 hours of cultivation. The cells were harvested after 19 hours of cultivation. The harvested cells were resuspended in Ni-NTA- equilibration buffer, mechanically disrupted by homogenization and cell debris were removed by centrifugation, microfiltration as well as diafiltration to concentrate the protein concentration in the cell lysate solution. This solution of the cell lysate was loaded on the Ni-NTA column (15 mL Ni-NTA resin) with a flow rate of 1 mL min-1 cm-2. Then the column was washed with 10 column volumes (CV) Ni-NTA equilibration buffer. 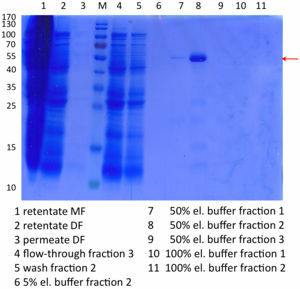 The bound proteins were eluted by an increasing Ni-NTA elution buffer step elution from 5 % (equates to 25 mM imidazol) with a length of 40 mL, to 50 % (equates to 250 mM imidazol) with a volume of 80 mL, to 80 % (equates to 400 mM imidazol) and finally to 100 % (equates to 500 mM imidazol) with a volume of 80 mL. This strategy was chosen to improve the purification caused by a step by step increasing Ni-NTA-elution buffer concentration. The elution was collected in 10 mL fractions. 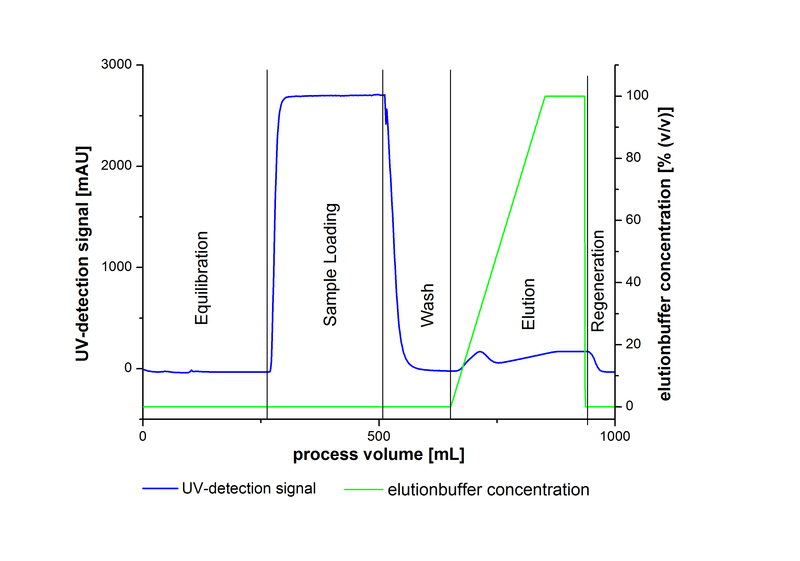 In Figure 8 only the UV-detection signal of the wash step and the elution are shown, this is because of the high UV-detection signal of the loaded samples and to simplify the illustration of the detected product peak. A typical chromatogram of purified laccases is illustrated here. The chromatogram of the ECOL elution is shown in Figure 8. 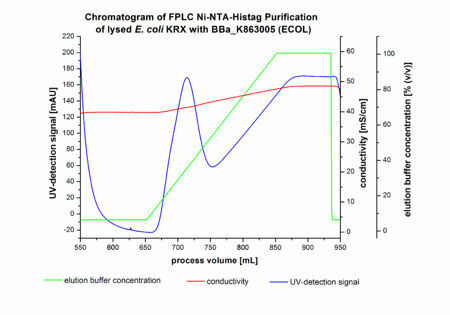 Figure 8: Chromatogram of wash and elution fractions from FLPC Ni-NTA His tag purification of ECOL produced by 12 L fermentation of E. coli KRX with BBa_K863005. ECOL was eluted at a concentration of 50 % (equates to 250 mM imidazol) with a maximal UV-detection signal of 292 mAU. The chromatogram shows two distinguished peaks. 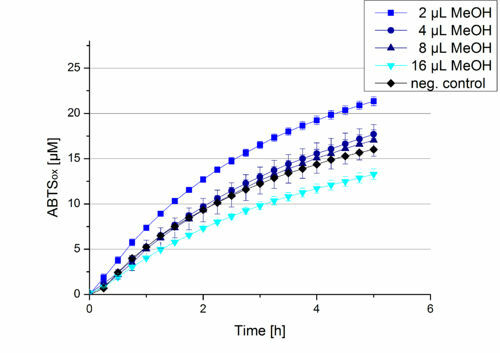 The first peak was detected at a Ni-NTA-equilibration buffer concentration of 5 % (equates to 25 mM imidazol) and resulted from the elution of weakly bound proteins. After increasing the Ni-NTA elution buffer concentration to 50 % (equates to 250 mM imidazol), an UV-detection signal peak of 140 mAU was measured. The area of this peak indicates that a high amount of protein was eluted. In addition, a second peak right behind the first peak can be detected. At this point it is not clear which peak contains our product and which peak is caused by impurities. The corresponding fractions were analyzed by SDS-PAGE to detect ECOL. A last peak can be detected after increasing the elution buffer concentration to 100 % (equates to 500 mM imidazol). This peak could be explained by impurities which were strongly bound on the Ni-NTA-resin. All corresponding fractions with an UV-signal were analyzed by SDS-PAGES. The Results are shown in Figure 8. Figure 9: SDS-PAGE of purification from the 12 L fermentations from 10/11 (BBa_K863005). Purification of the supernatant via microfiltration, diafiltration and Ni-NTA column (step gradient with 5 %, 50 % and 100 % elution buffer). 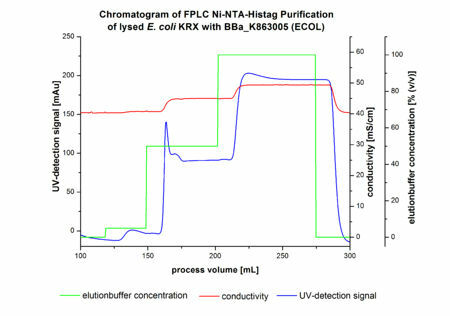 In Figure 9 the SDS-PAGE of the Ni-NTA purification of the lysed E.coli KRX culture containing BBa_K863005 is illustrated. It shows the permeate and retentate of microfiltration and diafiltration respectively, several fractions of flow-through, wash and the elutions with different buffer concentrations respectively. 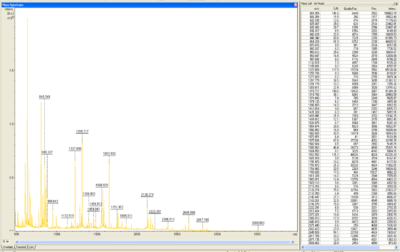 The selected samples were taken where peaks were seen in the chromatogram. The His-tagged BPUL has a molecular weight of 53.4 kDa. The red arrow shows ECOL. Unfortunately it could not be identified because the MALDI was broken-down for the last two weeks. 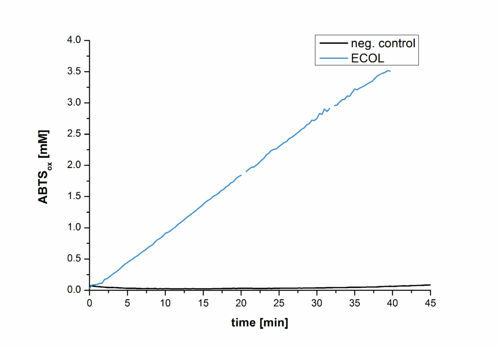 A cultivation of ECOL has been done and the fractions of the purification were analyzed further on protein content and re-buffered subsequently into deionized H2O. To determine the protein content afterwards because of loss of proteins through re-buffering, another protein concentration measurement has been done. The re-buffered fractions have been incubated with 0.4 mM CuCl2 to gain higher activity of the laccases, because they are copper-dependent. Standard activity tests were done with all ECOL fractions with adjusted protein content for comparison. The experimental setup included the ECOL fractions, Britton-Robinson buffer (pH 5) and 0.1 mM ABTS. Measurements were done at 25 °C. Resulting, one fraction showed very high activity in comparison to the other fractions (see Fig. 10). This fraction, fraction 50% 2, oxidized up to 23 µM ABTS after 5 hours. The first number of the sample indicates the percentage of used elution buffer, whereas the second number stands for the fraction number of this elution. This fraction was set as containing 90 % ECOL laccase of the whole protein content. Therefore a ECOL concentration of 63,9 µg mL-1 was gained. This fraction was analyzed further on pH optimum, temperature dependency and ABTS saturation. 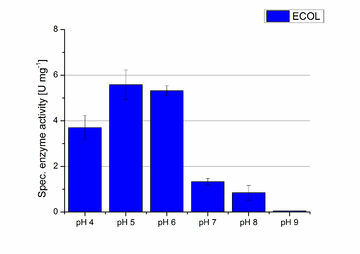 Figure 10: Activity assay of each purified fraction of the cultivation with ECOL. Samples were re-buffered into H2O and the protein amount in each fraction has been adjusted. The measurements were done using the standard activity assay protocol over night. The first number indicates the percentage of used elution buffer, whereas the second number stands for the fraction number of this elution. Another test of ECOL was done to survey the best CuCl2 concentration for the activity of the purified ECOL laccase. 0.03 mg mL-1 protein were incubated with different CuCl2 concentration ranging from 0 to 0.7 mM CuCl2. Activity tests were performed with the incubated samples, in 100 mM sodium actetate buffer (pH 5), 0.1 mM ABTS, to a final volume of 200 µL. The activity was measured at 420 nm, 25°C and over a time period of 10 hours. As expected the saturation takes place after 5 hours (see Figure 11). 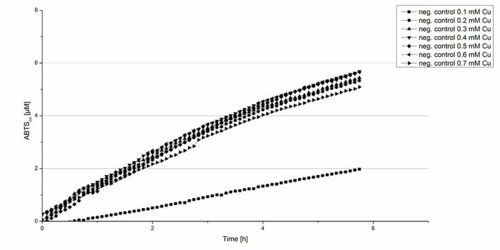 The differences in the activity of ECOL laccase incubated in different CuCl2 differ minimal. The highest activity of ECOL laccase is observed after incubation with 0.4 mM CuCl2 (42% of added ABTS). With a higher concentration of 0.7 mM CuCl2 the activity seems to be reduced (only 41% ABTS got oxidized). This leads to the assumption that CuCl2 supports the ECOL laccase activity but concentrations exceeding this value of CuCl2 may have a negative impact on the ability of oxidizing ABTS. Without any CuCl2 application ECOL laccase show less activity in oxidizing ABTS (see Figure 12). This fits the expectations as laccases are copper reliant enzymes and gain their activity through the incorporation of copper. Additionally negative controls were done using the tested concentrations of CuCl2 but no laccase was added to detect the oxidization of ABTS through copper (see Figure 12). The more CuCl2 was present, the more ABTS was oxidized after 5 hours. Still the maximal change accounts only for ~6% oxidized ABTS after 5 hours. 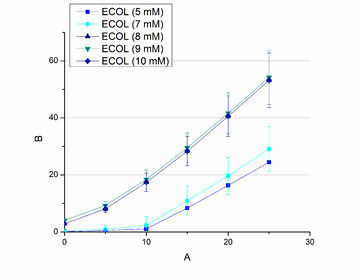 Figure 11: Activity measurement using 0.1 mM ABTS of ECOL incubated in different CuCl2 concentrations. Incubation with 0.1 mM CuCl2 or higher concentrations leads to an increase in ABTSox. 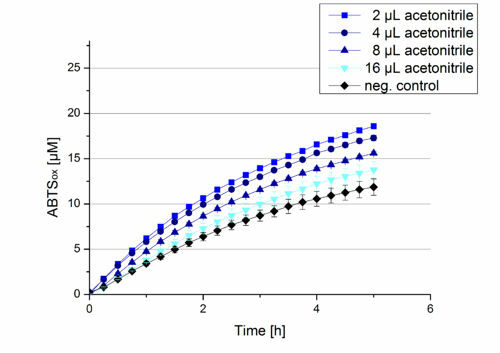 Figure 12: Negative control for CuCl2 activity Tests using different concentrations of CuCl2 H2O instead of laccase to determine the potential of ABTS getting oxidized through CuCl2. 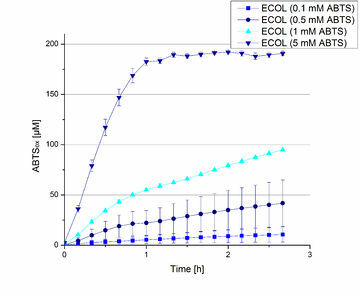 Figure 13: Analysis of ABTS oxidation by ECOL laccase tested with different amounts of ABTS. The higher the amount of ABTS the more oxidized ABTS can be detected. Furthermore ECOL laccase were tested using different amounts of ABTS to calculate KM and Kcat values. The same measurement setup as described above was used only with different amounts of ABTS. As anticipated the amount of oxidized ABTS increased in dependence of the amount of ABTS used (Figure 13). The results of the measurements of the samples tested with 16 µL could not be detected longer than 1.5 h because the values were higher than the detection spectrum of the device used (TecanReader). For substrate analytic tests the influence of MeOH and acetonitrile on ECOL laccase had to be determined, because substrates have to be dissolved in these reagents. 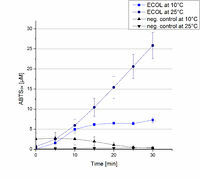 The experiment setup included 0.03 mg mL-1 ECOL laccase, 100 mM sodium acetate buffer, different amounts of MeOH (Figure 14) or acteonitrile (Figure 15), 0.1 mM ABTS, to a final volume of 200 µL. The activity of ECOL was found to be increased in presence of low concentrations (1 % v/v) of either MeOH or acetonitrile resulting in an higher amount of oxidized ABTS after 5 hours. Increasing concentrations of either substance decrease this positive effect, resulting in a significantly decreased laccase activity in presence of 8 % (v/v) MeOH. These results indicate that for further measurements in substrate analytics it is recommended not to use high concentrations of MeOH or acetonitrile to ensure the functionality of ECOL. Figure 14: Standard ECOL activity test applying different amounts of MeOH. No considerable impact on the activity can be detected. Figure 15: Standard ECOL activity test applying different amounts of acetonitrile. No considerable impact on the activity can be detected. To calculate the activity in Units mg-1, measurements had to be done under substrate saturation. With this the comparison of Units mg-1 with other laccase activities and the literature is possible. 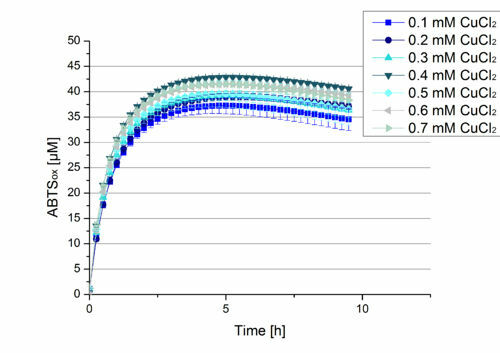 To find the optimal substrate saturation ABTS concentrations ranging from 0.1 mM to 8 mM were applied in an experimental setup containing Britton Robinson buffer (pH 5) and temperature conditions of 25 °C. For measurements with 0.1 mM to 5 mM ABTS, 616 ng BHAL laccase were used (see Fig. 16). For measurements with 5 mM to 8 mM ABTS only 308 ng BHAL laccase were applied (see Fig. 17). The amount of oxidized ABTS increased according to the increase of ABTS concentration. To make sure that the substrate saturation is given, 9 mM ABTS have been used in further tests. Figure 16: Activity assay to determine the substrate saturation with ABTS as a substrate. Measurements were done with 616 ng ECOL laccase in Britton-Robinson buffer (pH 5) at 25 °C. ABTS concentrations ranged from 0.1 mM to 5 mM. Figure 17: Activity assay to determine the substrate saturation with ABTS as substrate. Measurements were done with 308 ng ECOL in Britton-Robinson buffer (pH 5) at 25 °C. ABTS concentrations ranged from 5 mM to 8 mM. An ABTS concentration of 8 mM was determined as substrate saturated. Figure 18: Microtiter plate of the measurements for pH optimum determination. The more intensive the blue color the more ABTS got oxidized. At pH 4 and pH 5 the darkest colour has been reached. Activity assay measurements for ECOL laccases were done to find the optimal pH for further analysis. Britton Robinson buffer, adjusted to pHs ranging from pH 4 to pH 9, was used with 9 mM ABTS to detect the change in OD420. The measurements were done with 308 ng ECOL laccase for each sample. The highest activity was reached when measured in Britton Robinson buffer at pH 4 and pH 5 (see Fig. 18, Fig. 19 and Fig. 20). More than 5 U mg-1 of specific enzyme activity have calculated for these pHs (see Fig. 20). When testing the activity under basic conditions, the enzyme activity decreases. At pH 7 about 1 U mg-1 was determined. This makes an application of the ECOL not feasible since the water in the waste water treatment plants is in average of pH 6.9. Figure 19: Oxidized ABTS by ECOL at different pH adjustments. The experimental setup included CuCl2 incubated ECOL (308 ng), Britton Robinson buffer adjusted to the tested pHs and 5 mM ABTS. Measurements were done at 25 °C for 30 minutes. The most amount of oxidized ABTS can be detected at pH 4 and pH 5. 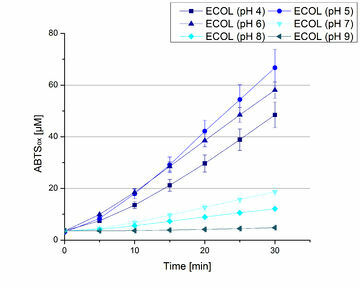 Figure 20: Calculated specific enzyme activity of ECOL at different pH conditions. The highest specific enzyme activity for ABTS is under pH 4 and pH 5 conditions. The higher the pH, the less ABTS gets oxidized. One unit is defined as the amount of laccase that oxidizes 1 μmol of ABTS substrate per minute. Fig. 21: Standard activity test for ECOL measured at 10 °C and 25 °C resulting in a decreased activity at 10 °C. As a negative control the impact of 0.4 mM CuCl2 in oxidizing ABTS at 10 °C and 25 °C was analyzed. Fig. 22: Deriving from the obtained values of oxidized ABTS in time at 10 °C and 25 °C the specific enzyme activity was calculated. For the temperatures a difference of 9 U/mg-1 could be detected. One unit is defined as the amount of laccase that oxidizes 1 μmol of ABTS substrate per minute. To investigate the activity of ECOL at temperatures that will apply at a waste water treatment plant throughout the year, activity tests were performed at 10 °C and 25 °C as described above. The measurements were conducted for 30 minutes. The obtained results reveal a lower activity of ECOL at 10 °C in comparison to 25 °C (see Fig. 21). The received values were used to calculate the specific enzyme activity which was between 1 and 12 U mg-1 , respectively (see Fig. 22). The negative control without ECOL but 0.4 mM CuCl2 at 10 °C and 25 °C show a negligible oxidation of ABTS. The activity of ECOL is decreased to about 90% at 10 °C. An application of ECOL at warm temperatures is therefore possible but during the cold seasons a more cryo stable enzyme would be preferable. from Brunker Daltronics. TheE. coli laccase P36649 was identified with a mascot-score of 108 with an automatic run. In Figure 23 and 24 the chromatogram of the peptid mass fingerprint and the single masses are shown with a sequence coverage of 26,1%. It can be assumed that the isolated protein is ECOL. Figure 23: The MALDI-TOF-MS (matrix assisted laser desorption ionization time-of-flight mass spectrometry) spectrum. The measurements were made to test if the produced laccases were able to degrade different hormones. Therefore the produced laccases were inserted in the same concentrations (3 µg mL-1) to the different measurement approaches. To work with the correct pH value (which were measured by the Team Activity Test) Britton Robinson buffer at pH 5 was used for all measurements. The initial substrate concentration was 5 µg mL-1. The results of the reactions without ABTS are shown in Figure 25. On the Y-axis the percentages of degraded estradiol (blue) and ethinyl estradiol (red) are indicated. The X-axis displays the different tested laccases. The degradation was measured at t0 and after five hours of incubation at 30 °C. The negative control was the substrate in Britton Robinson buffer and showed no degradation of the substrates. 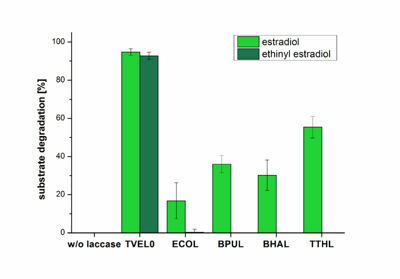 The bought laccase TVEL0 which is used as positive control is able to degrade 94.7 % estradiol and 92.7 % ethinyl estradiol. 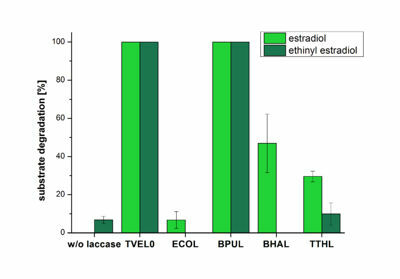 The laccase BPUL (from Bacillus pumilus) degraded 35.9 % of used estradiol after five hours. ECOL was able to degrade 16.8 % estradiol. BHAL degraded 30.2 % estradiol. The best results were determined with TTHL (laccase from Thermus thermophilus). Here the percentage of degradation amounted 55.4 %. The results of the reactions of the laccases with addition of ABTS are shown in Figure 26. The experimental set ups were the same as the reaction approach without ABTS described above. The X-axis displays the different tested laccases. On the Y-axis the percentages of degraded estradiol (blue) and ethinyl estradiol (red) are shown. The degradation was measured at t0 and after five hours of incubation at 20 °C. The negative control showed no degradation of estradiol. 6.8 % of ethinyl estradiol was decayed. The positive control TVEL0 is able to degrade 100 % estradiol and ethinyl estradiol. The laccase BPUL (from Bacillus pumilus) degraded 46.9 % of used estradiol after ten minutes incubation. ECOL was able to degrade 6.7 % estradiol. BHAL degraded 46.9 % estradiol. 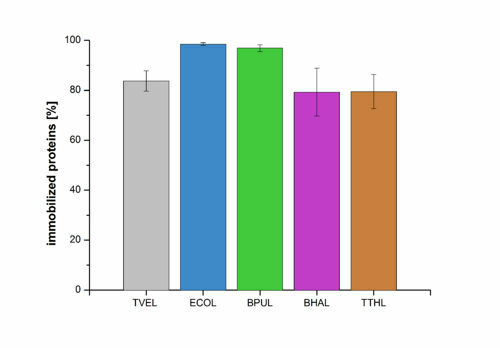 With TTHL (laccase from Thermus thermophilus)a degradation 29.5 % were determined. Figure 27: The percentage of laccases immobilized to CPC-Beads. 99 % of ECOL, 97 % of BPUL and 79 % of BHAL and TTHL laccases were bound to the beads. 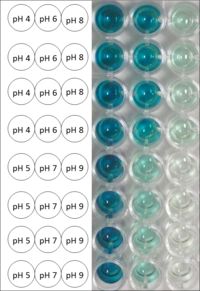 Figure 27 shows the percentage of laccases bound after incubation with CPC-beads, relative to the original concentration. The concentration of laccases in the supernatant after incubation was measured using Roti®-Nanoquant. The results showed that only 1% of ECOL laccases was still present in the supernatant. This illustrates that ECOL was successfully immobilized on the CPC-beads. 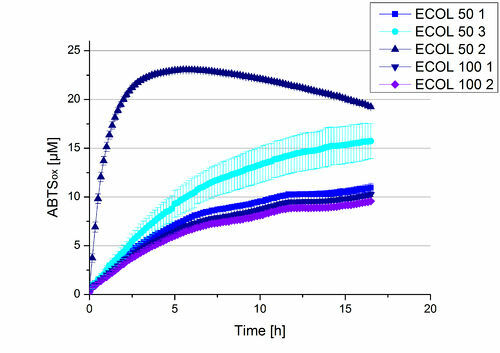 Figure 28: Enzymatic activity of ECOL supernatant compared to the activity of nontreated laccases, measured using 0.1 mM ABTS at 25°C over a time period of 12hours. The results show a dramatic decrease of ECOL in the Supernatant. 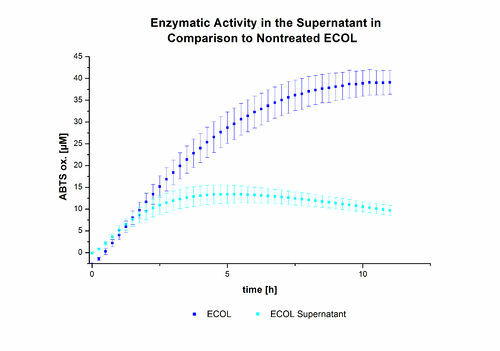 In figure 28, the enzymatic activity of ECOL in the supernatant is compared to the activity of nontreated ECOL. Although an activity can already be detected in the supernatant, this activity is low compared to the original. Figure 29: Illustration of ABTS oxidation by ECOL with time compared to the negative control. The increase in ABTS oxidized proves laccase activity. Figure 29 shows the illustration of ABTS oxidation by ECOL with time compared to the negative control. The increase in ABTS oxidized proves laccase activity even if a direct comparison with the original and not immobilized laccase solution was not possible due to the measuring methods. Figure 30: The color and the concentration of bacterium liquid. (A) The color degree among different bacterium liquid. The higher concentration of bacterium liquid showed redder. (B) The OD600 of different concentration of baterium liquid at different times using ultraviolet spectrophotometer. We transferred our new part BBa_K1779204 (combined BBa_K863005 with BBa_E1010) into Escherichia coli BL21 (DE3). Figure 30 showed the bacterium liquid became red, which confirmed that we successfully made the laccase visible.